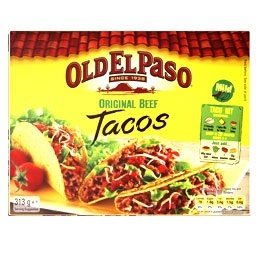 Disclaimer: Old El Paso supplied me with a Beef Taco Dinner Kit to cook and review but all thoughts and opinions are my own. Here in the UK, we’ve just enjoyed another long weekend with today’s May Day Bank holiday. I’ve barely got back to the old routine after the Easter weekend, just a few weeks ago, and after the tube strike in London last week, Mayfair Dad and I needed a bit of a rest to be honest. On Tuesday, I had a hellish bus journey to Harrow-on-the-Hill tube, the nearest that was open. It took me one whole bum-numbing hour to do a (normally) 10 minute journey. Being positive, I did manage to read half my book on the way. Then, with no Jubilee line to connect to, I had to walk the extra 20 minutes to Our office in Mayfair. I deserved my breakfast on arrival. Mayfair Dad had a day trip to Luxembourg that day and I am pretty sure he arrived at his destination before I arrived at mine! Sadly, Wednesday wasn’t much better. Having seen the queue for the bus (and that I had just missed one! ), I decided to fuel up at Starbuck’s (their fruit bread is my absolute favourite – not low GI at all, but definitely so jam-packed with fruit, it must at least be one of my five-a-day!). I then walked myself, latte defiantly in hand, past the queue at the bus stop, on past the bus I missed, on past another bus and on to the tube station at Harrow, arriving about 40 minutes later. It was a lovely sunny morning to be strolling along. Shame about the pollution from the exhausts of all the near-stationery vehicles on the way though…and I was a little hypoglycaemic on arrival, quickly resolved with a carton of juice (the second of my five-a-day). Thankfully, the Jubilee line was running a service from Finchley Road to Green Park by the time I got there, so I didn’t have to walk down to Mayfair again! I think I would have collapsed in a heap if I had. Journeys home were only a little less fraught, with no added pressure for having to collect a little Chap by 6pm at all. My only concern was that Little Chap isn’t keen on a mild chilli con carne, even those made for kids, so I wasn’t going to make one from scratch and risk over-facing him with too much chilli. Having recently received a generous box of the latest and greatest kits and accompaniments from Old El Paso, I chose their Beef Taco Kit, on the grounds that it is “mild”. Taco kits are also one up on finger food, serving the tasty mince with shredded lettuce, chopped fresh tomatoes, grated cheese, salsa and anything else you fancy, so I hoped the novelty of helping himself to a range of appetising favourites might encourage him to try some new flavours. I chose to add some low-fat creme fraiche, in case he found it a bit spicy and some chopped black olives I had left in the fridge – they’re his favourite – but you could also add sweetcorn, sliced peppers, mushrooms, avocado slices or guacamole or chopped jalapeños, depending on your taste. 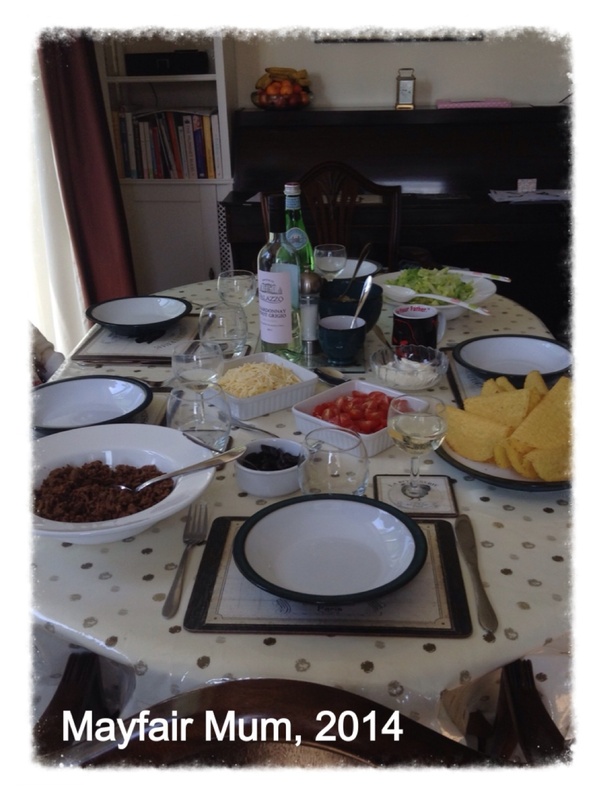 The kit provides the tacos, a sachet of salsa sauce and a packet of spice mix for the beef. I added the aforementioned extras which I prepared while the beef mince was cooking and 500g of fresh lean minced beef. The mince took a few minutes to brown, before I added the spice mix and 100 ml water. While it simmered, I sliced the lettuce, chopped the tomatoes and olives, served up the pre-grated cheese, the creme fraiche, the salsa sauce and finally popped the tacos in the oven for a couple of minutes, while a sachet of brown basmati rice steamed happily in the microwave. In about 20 minutes, I had the table set, food served and Ta Da! We were ready to tuck in! So what was the verdict? Well, there was hardly any left. The four adults all came back for seconds and I thought it was very tasty, even if it didn’t have as much heat as we might have cooked it ourselves. It made a great light lunch. It could also be easily adapted to turkey mince if you prefer white meat, or to beans or other mince substitute if vegetarian. Nobody need miss out on the fun. As for Little Chap, the tacos were a revelation. The idea that he could eat his lunch from a giant crisp was all too exciting for words. Having “encouraged” him to try a little of everything on offer (with the exception of the salsa – I didn’t want to push my luck! ), I witnessed him eating the dreaded lettuce, usually greeted with the words: “But I don’t like lettuce Mummy!” as well as trying the mince in the spicy sauce “But I don’t like mince Mummy” (not actually true, given he regularly eats cottage pie, shepherds pie and lasagne to name just three mince dishes). We followed lunch with a quick game of Lego Chima Speedorz racing and a lovely stroll with Little Chap’s football (he’s trying to master drop kicking!) to our local water meadows, bumping into friends spontaneously at a local walled garden and finishing up in the pub garden with a G&T watching a cricket match at the local club on the other side of the road. We enjoyed ourselves so much, Little Chap begged us for a repeat visit this afternoon and we could barely get him to come home! So, all in a success. A tasty, healthy, light lunch, that took next to no time to prepare and appealed to the most discerning palate of all – the school child. Meanwhile, I’m all fired up to try some of the other meal ideas we received, including some spicy rice meals, a hot(!) casserole mix and some interesting sauces. Watch this space! 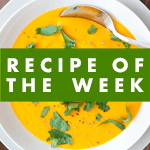 I linked this up to A Mummy Too’s #Recipeoftheweek as its been a while. Hoping you enjoyed your Bank Holiday weekend too. This entry was posted in #RecipeoftheWeek, Linky Love, Making & Baking, Memory Lane, Parenting & Family, Reviews & Recommendations and tagged family, food, friends, fun, kids, Little Chap, Mexican, Old El Paso, quick meals, recipes. reviews by Mayfair Mum. Bookmark the permalink. Pingback: Gathering in the May…the Mexican Way! Oh yummy! I love Old El Paso kits, my favourite is the Fajita one, but I think my 7 year old would also love the idea of eating out of a big crisp! Fajitas are also a favourite here too. Thanks for stopping by. Very tasty. Can fill them with anything really but some good Mexican with all the trimmings works best. Thanks for stopping by. Now I have a Mexican craving!